One of the biggest problems facing poor smallholders in developing countries is their lack of access to relevant, affordable and timely information on agri-business issues, especially in relation to export markets. This impacts on their ability to engage fairly within both local and global trade. At the same time, the challenges of climate change, food security and increased pressure on natural resources means that the buyers, exporters and certification schemes urgently need to engage with hundreds of thousands of smallholders around the world on these issues – which also directly affect the farmers’ livelihoods. The Smallholder Support Network (SSN) was set up by the Lorna Young Foundation in 2010 in order to address the training and information needs of smallholder organisations around the world. The ultimate aim of the SSN is to equip poor smallholders with greater levels of unbiased knowledge and understanding of the markets that they sell to. The SSN works on the premise that improved crop husbandry will lead to greater yields and quality. These are the factors that will lead to improved prices for produce over the long term and which will result in more sustainable livelihoods and a reduction in poverty in developing countries. Working out of Ethiopia and Kenya – LYF’s pilot countries for the SSN – an unusual and empowering approach has been created. The SSN has created a dialogue directly with smallholder populations via RADIO, SMS and INTERNET platforms. These technologies deliver real LIVE TIME updates on issues affecting smallholder crops and livelihoods. At the current time, the SSN’s focus is on coffee farming and in March, this month, for the first time ever, an exchange visit of Kenyan coffee board members will take place in Ethiopia, so that training and exchange of information in relation to the international coffee industry can occur. The SSN’s Radio Agriculture Extension Officer, Joseph Macharia, will be following 4 coffee board members as they travel throughout the supply chain in Ethiopia. They will meet millers, auctioneers, tasters, sales and marketing experts and buyers and will learn about the international coffee trade, with the new knowledge being brought back to Kenya via the SSN Radio broadcasts – hosted by the Kenyan Broadcasting Corporation’s channel Coro FM. Over the past 6 months the SSN has collaborated with a wide range of stakeholders throughout its SSN Radio broadcasts in Kenya – including certification schemes, exporters, coffee buyers, NGOs and government bodies, with the express purpose of ensuring that smallholders are receiving information that is timely, relevant and up to date. Unlike some other initiatives, the SSN does not believe in the dissemination of biased information i.e. ‘training’ which pushes any one production approach or certification scheme, which all too often are made up of content which is more important to the big business or to the stakeholders involved in the industry and their own sales figures. Rather, it is about developing a two way dialogue with smallholders in rural farming communities. One of the major objectives of the SSN has always been to empower smallholder organisations to make better business decisions with the buyers of their products. The SSN is now achieving this by developing smallholders’ understanding of ethical certification, sustainable agriculture, supply chains, export markets, business requirements and international trade. The SSN uses an SMS platform to develop the dialogue; smallholders send their questions on the coffee industry to the SSN Radio Programme and they are answered by a team of experts working in the coffee industry. This approach is truly empowering. It provides smallholders with a voice and an opportunity to engage more effectively with one another, with agricultural extension services, development organisations and with the buyers and even the consumers of their produce. 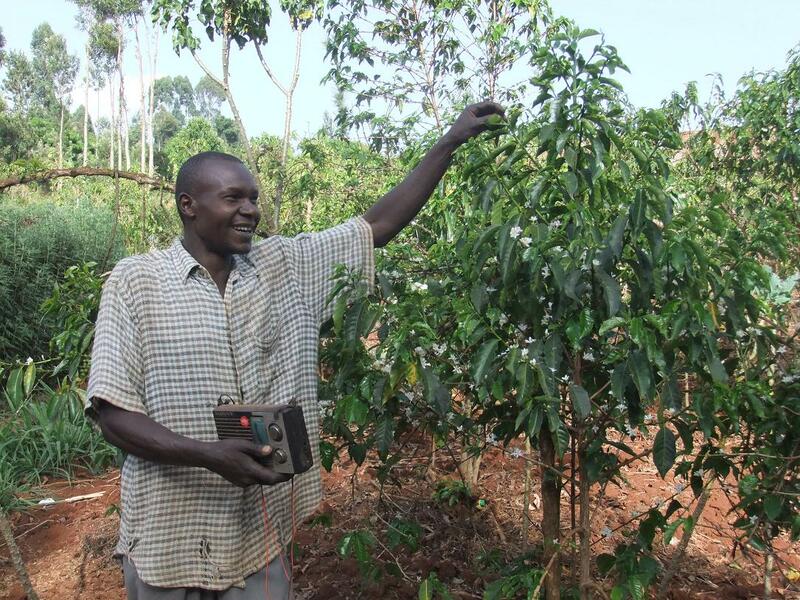 Working with Agricultural Extension Officers in Kenya, the SSN targets coffee smallholders via the medium of RADIO, assisting them with learning on key issues, such as quality, yields, climate change and food security. These broadcasts are now reaching an audience of 4.5 million people and some 500,000 coffee farmers via Kenya’s Coro FM. SSN’s ‘Farmers Gold’ or ‘DhahabuYaMurimi’ as it is known in the local Kikuyu language, is the first Radio Programme of its kind that brings together a multi stakeholder platform –of ‘specialised’ NGOs, buyers, exporters, research and training institutes with the express purpose of reaching smallholders. After being delivered via the airwaves – the Radio broadcasts are then uploaded onto the internet, where they can be accessed as podcasts at any time. 1) Farmer Field Listening Groups: Two groups of 15 farmers from 2 different coffee cooperatives (the ‘Rumukia’ and the ‘Gikanda’ Coffee Cooperatives) make up the Farmer Field Listening Groups and act as the SSN pilot ‘listeners’. As individuals they are committed to raising queries via SMS, but as a collective they also work together to generate content for the radio programmes and to ensure that its content addresses the key concerns of coffee smallholders. 2) Multi-stakeholder Platforms: The SSN has adopted a multi-stakeholder approach in order to ensure that farmers have the most up to date and important facts, on a broad spectrum of issues and from reliable sources. The SSN brings together a platform of coffee stakeholders such as millers, buyers, agricultural extension staff and development specialists in the supply chain to generate information on issues affecting smallholders livelihoods (i.e. prices, volume requirements, pests, diseases, diversification, food security, droughts, weather, sustainable agriculture). The stakeholders are responsible for answering smallholder questions via the live feedback facility which relies on communication from farmers through SMS text messaging. Every week, 5 key questions which have been generated via SMS are addressed in the radio programme. d) Climate Change (food security, diversification, sustainable agricultural practices). The radio programmes are aired on prime time vernacular radio, in the evening in order to facilitate access to information for women. These programmes are then translated and made available as podcasts through the SSN portal. It seems that the genuine ‘grassroots generated’ nature of the content – accompanied by ‘answers from the experts’ has been a key factor in engaging the attention of smallholders across this region of Kenya. This entry was written by Ian Agnew, posted on 12/03/2012 at 10:17 pm, filed under Farmer Extension Programme, Project News and tagged Africa, African farmers, agriculture, APPG, capacity building, CMS, coffee, coffee trade, Coro FM, Dormans, Ethiopia, extension services, fair trade, fairtrade, farmer voice radio, Kenya, Lorna Young Foundation, LYF, smallholder, trade justice, Trade not Aid, training. Bookmark the permalink. Follow any comments here with the RSS feed for this post. Post a comment or leave a trackback: Trackback URL. …..Certification requirements (wages, PPE, environmental standards)…….???? I think certification is boldy about Social, Economic, Biodiversity and Environmental concerns…. giving a product quality and safety assurance while being produced in a sustainable manner. (PPE, wages etc is a rather narrow way of expressing Certification requirements I believe). I do not think the text message approach would carry reasonable weight to warrant action on the part of farmers. In other words, that is easier said than done! Face to face approaches work best, especially given the fact that the famers already have lots of information. Thanks for the comment. You’re right that face to face approaches work best; but this is almost impossible to achieve except at very small scale, unless someone is willing to pay the high costs of armies of extension workers – suggestions always welcome for how this can be paid for. In the meantime, with the very small resources that we have available to us as a small charity, we find that using radio to reach people, and enabling listeners to SMS (text) questions in to the panel, is the most effective and cost-effective way to get information and advice to a larger number of farmers. Our experience on the ground and our discussions with farmers also tell us that farmers do not actually have access to lots of information or, if they do, it is often not reliable or objective information. For example, many farmers tell us that the only people giving them information on fertilizers and pesticides are the companies that sell them! The reason we want to keep the radio programmes going is because the feedback from farmers and those in the industry is that they all really welcome and learn a lot from the programmes. The programmes have also generated a huge increase in requests for face to face extension services. Thanks again for the comment.